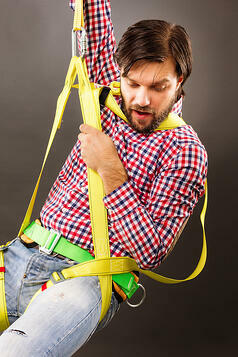 If your employees are exposed to potential falls, does your company have a fall protection rescue plan? In 2014, fall protection was the number one violation on OSHA’s top 10 most-cited violations, a position it has held for 4 consecutive years. OSHA regulation requires that employers provide a quick rescue to workers if they fall or ensure that the workers can save themselves. While the response time is not defined, it is recommended that physical or verbal contact is made within 6 minutes or less. Many companies believe that their company does not need a rescue plan because their workers rarely perform work requiring fall protection. But this is simply not true; even if one worker is required to work even slightly above a trigger height, which varies depending on industry and craft, a rescue plan must be implemented. Here are our 4 top reasons why you should develop a fall protection rescue plan. In low-risk workplaces, rescue training may not be as high of a priority as it should, if workers are lacking in proper training there is a larger risk of injury or even loss of life. While lower-hazard workplaces may not need rescue training as much as others, it still should be a high priority and regularly done. Regardless of how high risk a workplace is, rescue training should be provided when a new hazard or any new equipment is introduced to the work environment or whenever a change is made to the rescue plan. According the OSHA the ideal rescue situation has the worker rescuing themselves without assistance from others. Personal rescue devices are now available that allow the suspended worker to lower himself or herself at a safe speed ensuring that self rescue is possible. In the event that self rescue cannot be accomplished your rescue plan may include assisted or two-person rescue. Taking a step back and visualizing what needs to be done can make developing this plan not as complex as you may think. In any of these cases, workers may not be able to use self-rescue or even in some cases call for help. This is why your comprehensive plan should include a requirement for a second worker to be monitoring the primary worker while working at heights. Building an effective rescue plan must account for both the reaching and retrieval of the worker. Employers and supervisors must assess what hazards may pop up, being completely objective in order to know if it is necessary to call emergency response or not. The incorporation of an on-site rescue team may be necessary depending on the physical surroundings of the workplace to ensure qualified people are there at the right time to help. With proper training, equipment and planning the rescue plan can lower the amount and extent of fall related injuries and OSHA citations in your workplace.